Here is a quick post about a recent shoot with Kyla Flaiani. She has had a busy few months on the press call scene. The winner of Miss Buck Whaleys 2012 and Assets Model, she Represented Buck’s in this years Miss Ireland competition. Kyla and her Mom came down to my studio recently to get some fresh shots for her portfolio. It was great to meet Kyla and shoot with Kyla again. I had meet her previously when she also entered the Miss Wright Venue competition and made it through to the finals. Aimee Connolly was with us on the day done a great job on the Hair and Make-Up as usual. From a photography point of view, I was wanted to try out some more shots with the Smoke machine. Smoke can be a great addition to an image, if used right. One has to experiment with it do see what looks good and what looks bad. Another thing I wanted to try out was new light panels that I got. I used them on the shot on the right to give a nice even light on both sides of Kyla. Thats it for now, its a very short and sweet post as things are super busy here in the studio these days. September Portfolio days are all booked up but stay tuned to see when the October dates are announced. 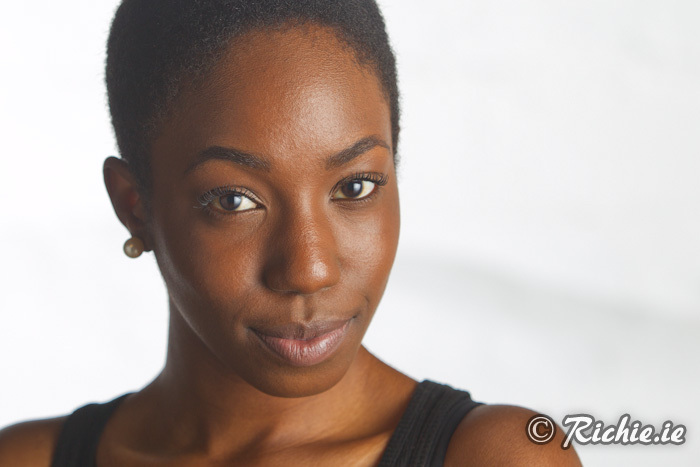 I recently had the privilege of shooting with Patricia Olufemi from Absolute the Agency. It was very refreshing and inspirational to work with Patricia. She has such passion and determination to break into the modeling industry it was great to see. The shoot came about after Patricia messaged me on my FaceBook Page (www.facebook.com/richiephoto) and asked if I would be her mentor and give her some tips on entering the Irish market. I was very flattered to think that some one would like to have me as a mentor. I said to her pretty much straight away though that I would not be a very good mentor for her as I do not work with in the industry and so would not be as experienced or knowledgable as a fashion photographer. There are many, many other photographers who could be better suited to helping her. But she persisted and we set a date for a test shoot. I don’t do many test shoots but was a good opportunity to test my new smoke machine some lighting set-ups on dark skin. Also, I had not shot a model with short hair before, so that was a refreshing change from every one having extensions these days. Patricia arrived down anyway for a planned 2 hour chat and shoot…. which turned into 5 hours or so. You can read her account of the shoot on her Blog Here. Which pretty much sums it all up. We talked about her move from London to Ireland, how that was a negative move in terms of the fashion industry. We talked about her inspirations and what motivates her to be a model. There is a great post on her blog about her attempt to get scouted by Elite in Dundrum. It is a great read and it show her passion and determination very well. We started of shooting some headshots. I wanted to test out a few lighting setups and Patricia is interested in acting, so it worked out well. I try to start with headshots when possible as it is when I start to coach who ever is in front of my camera and give them some tips on facial expression. Patricia was great at the headshots. She was not afraid to let go and have some fun with it… which is the important thing when it comes to a headshot session for me. Patricia done her own make-up for the day. The looks were pretty natural so there was not much make-up applied. After the headshots, I fired up the new smoke machine that I got. I got it to be able to do something different in the studio and spice things up a little. I won’t be using it for every shoot, but there comes a time when you need that little something something to make a shoot work. It has a remote control with it, so it means I can set it in the corner of the studio and leave it be, triggering it via the remote control in my hand… while I take the shot. It gives off smoke for a about 30 seconds before needing to re-heat for another minute and then its good to go again. The trick I found to using smoke is to back light it, making it more visible. I placed a light far back behind Patricia on the left side of the picture, that was pointing back towards her. This resulted in a soft rim light for her and also it added light to the smoke so it could be seen more clearly. Another trick is to not use too much. Once I use the smoke a bit more, I will do up a good post about the in’s and outs of it.